Length, camber, shape, graphics... there are so many factors to think about when you're choosing your new snowboard. It can be a big investment, so you want to make sure you get it right! 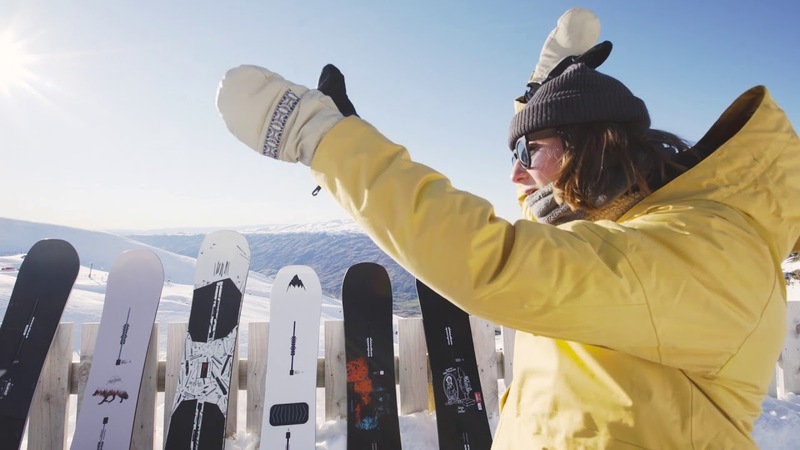 The team at Burton NZ have some awesome tips to make choosing a snowboard a really fun process, check them out below! Don&#x27;t wanna read the full article? Check out the video version! If you're in any doubt, head in & see the on-mountain Cardrona General Store team. They're super knowledgeable about all the Burton snowboards, & can send you out with a demo board to try before you buy! They're often set up out on the slopes at the bottom of McDougall's Chondola (look for the Burton tent) so you can demo a board right on the mountain. They'll even take the price of your demo off the price of your new board from the General Store... now that's a deal! Pure-Pop is a combination of traditional & Flat Top, for extra pop! As we said earlier, buying a board can be a pretty big commitment – for a lot of us we're locked into that board for at least the next couple of years. If you're planning on progressing your snowboarding a lot, and you reckon in a couple of years you'll need something more responsive, lighter & faster under your feet, it might be worth upgrading now. If your comfort zone is your happy place and you're more about cruising the mountain than progression, you might choose instead to get something for a similar level to what you are now – just be aware that once you start pushing yourself, you may need to upgrade sooner than expected! Most snowboards should sit somewhere between your collarbone & chin for maneuverability, but a snowboard really only knows how heavy you are (because you're crushing the thing all day)! So for those of us as tall as an Avatar but light as a fairy, your board can obviously sit below your collarbone. On the other hand, if you're the front row prop of the All Blacks & you take protein shakes with every meal, you might be better suited to a longer board. Always ask your friendly shop staff if you're not sure! Because if you look good, you feel good, & ride even better! Get out there & snowboard! The best way to know what you like to ride, is to try boards out! Remember you can suss that on-mountain with the team at the Cardrona General Store – we'll see you out there!